The Indian growth story is happening, and happening big. Whether it is FDI inflow or GDP or the number of new businesses being launched every year, all the benchmarks are pointing towards huge economic growth for India in this decade. Startups, MSMEs and the big enterprise giants are all betting big on India and stepping up their recruitment and expansion plans. With around 15 million freelancers (second only to the US) and 4 new startups being launched every single day, India is a very fertile ground for coworking spaces to bloom. It’s not just about sharing physical workspace, but also about fostering creativity, ideas and synergies that might not happen at all in walled office cubicles. The statistics clearly show that coworking spaces, globally as well as in India, are growing fast to keep pace with the startup boom. Number of global coworking spaces expected to increase from 11,100 now to 26,078 by 2020. That’s a 23.80% compounded annual growth rate. Deskmag survey reports show that 67% of all coworking owners want to expand their spaces this year. Also, 40% reported planning one additional location, and 86% of respondents anticipate getting more members this year. The rapid pace of growth in Asia is fast closing the gap with mature coworking markets like the USA, UK and Europe. A full 73% of Asian spaces are cooking up expansion plans this year, compared to much-lower global average of 66%. The number of new spaces coming up in Asia likewise is a huge 22% higher than the global tally. But the thing is that the coworking spaces India has and the country’s startups share a unique synergetic relationship. Coworking spaces in India concentrate heavily on startups, more so than any other segment. According to the latest Coworking India Survey study published by SocialWorkplaces.com, a full 50% of respondents said that over and above being a coworking space, they also provide Incubation / Acceleration and TechHub services. The Evoma coworking space in Bangalore is a good example of how this works. We’re located in the Evoma Business Center at #88, Borewell Road, in Whitefield, opp. Whitefield Post Office, Bangalore. Our coworkers get incubation support not just at the Borewell Road business center, but also through the mentors, services and support provided by hundreds of startups, SMEs and enterprise clients who are located at the various Evoma business centers in Bangalore. It’s like a business club – you’re Evoma, I’m Evoma. Let me help you out. Want to be a part of the Evoma club? Call 08041903000 or email inquiries@evoma.com. There’s also a cultural / demographic angle to it. The new breed of startup founders, who are overwhelmingly young millennials, prefer coworking space over working from their home, garage, basement or office space. 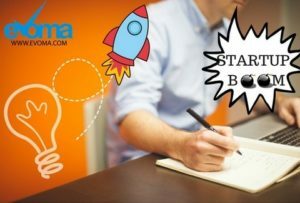 We can therefore conclude that the Indian startup boom is paving the way for the growing trend and numbers of the coworking spaces India’s major metros have. 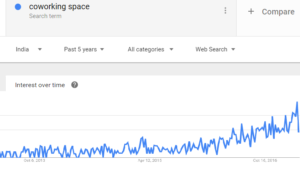 Even Google Trends confirms that interest in “coworking spaces” has seen a steep rise in India since around mid-2015. Not to mention the appeal of low startup costs, lower overheads, classy high-end locations, free WiFi and all the digital work tools they need, and other such advantages. Young tech startups are moving to the coworking spaces India has in droves, driven by their need to accommodate larger teams and expansion plans. Coworking might have started off as a fad or lifestyle choice for cool nerds. But now it’s gone pretty much mainstream as office space for startups, SMEs and enterprise branch offices who want to be a part of the startup movement. Want to part of a startup movement? Come cowork at Evoma for a day – Free. Call 08041903000 or email inquiries@evoma.com.